If Monsanto, Dow and Dupont chemical companies won’t listen to our pleas for non-GMO, organic food, we’ll just have to take growing our food into our own hands. Following is a list of 5 of the easiest vegetables to grow, even if you’ve never even watered a chia plant. Make sure you get heirloom, organic seeds to avoid perpetuating GMO seed monopolies. 1. Lettuces – Many kinds of lettuce grow fast and easily with a little organic soil and filtered water. If you grow them indoors in containers or pots, you don’t even have to worry about fending off other critters that like to munch on lettuce, too. You can also harvest your lettuce greens when they are still very young (or micro-greens) and enjoy their tender, flavorful leaves. Arugula and butter lettuce are very different in flavor, but high in nutrients. 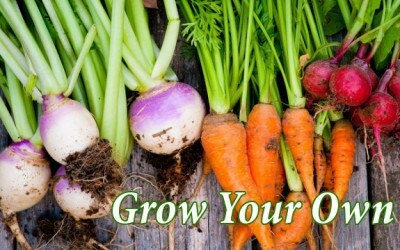 You can also grow spinach, kale, and other greens, as well. 2. Green Beans – Though many types of beans are easy to grow, ‘broad beans’ are so easy to grow that kids can even do it. Bush beans are more proliferate, but broad beans grow so effortlessly, you’ll want to plant some today! The only consideration is that you may need to plant your beans with a trellis or a simple bamboo post so they can ‘climb.’ You can also ‘put up’ beans by freezing them or pickling them to eat them all year long after harvesting. 3. 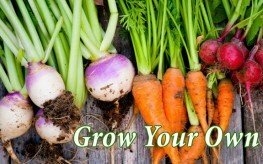 Carrots – This root vegetable is so easy to grow, you can actually plant carrot tops from organically grown produce in some rich soil, and soon, you’ll have new carrots. Just make sure you have a deep pot if you aren’t planting outdoors. If you grow carrots in the ground with rocky, organic soil, they will come out looking crooked, but will still be delicious. (Fun fact: using deformed, ugly carrots is actually how baby carrots are made). 4. Cucumbers – This refreshing vegetable is great to grow to make your own pickles! You can essentially store them for years by pickling them, which also creates a great probiotic food to boost your immune system. Cucumbers need a little extra space to grow, so they aren’t the best container vegetable, but if you have a small garden, they are easy to grow. Just be sure to plant after any hard frost if you live in a colder climate. Some hearty heirloom varieties are Diva and Salad Bush. Here are 15 health benefits of cucumbers. 5. Tomatoes – This nutritious food grows well in containers or in organic soil, and is best planted in the summer months or in a climate that is warmer throughout the year. Tomatoes are great starter plant for kids. You can get starter plants from an organic nursery, a gardening neighbor, or you can even start from seed. Growing them from small plants will save time, but seeded tomatoes are fun to watch grow, too. Just be sure to choose heirloom, organic varieties, and not GMO so you can save seeds from the tomatoes you grow to sew future crops. Tomatoes invite lots of sun and need to be watered well, but grow very easily. You can harvest tomatoes from a singular plant all summer long. Add kale to the easy to grow list , too. Radishes are one of the EASIEST crops to grow, are healthful and nutritious, and grow prolifically with VIRTUALLY NO MAINTENANCE. You should have put those on your list.